Select the visibility of your flipbooks according to your needs. Once you've finished editing your flipbook, you get to decide if you share it with the whole world or only a precious few. In order to see all the visibility options, you have to click on Change above the Publish now button to open the Visibility overlay. 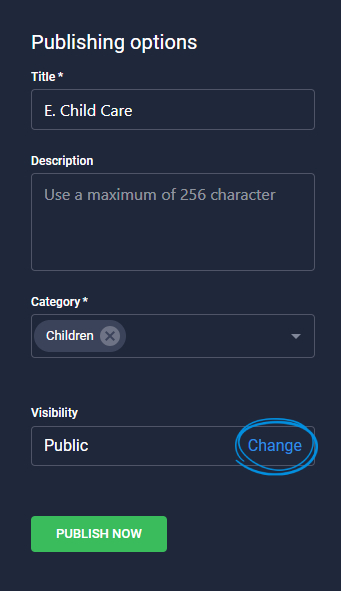 The public visibility option is set by default and it is available to all of our users. 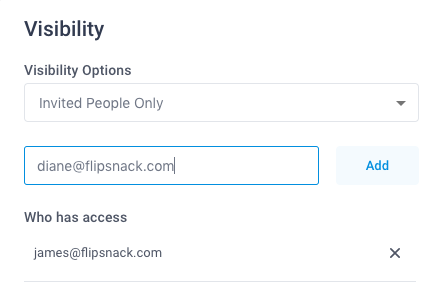 Public visibility means your flipbooks will appear on your public Flipsnack profile and they will be indexed by the search engines (Google, Bing etc.). Your public flipbooks can be easily seen or shared, which can be exactly what you wish to obtain. If you don't want your flipbooks to be easily read and you need more privacy, you can select the Unlisted option. This option is available for all of our premium users and it will give you the option to only share your creations via direct link. 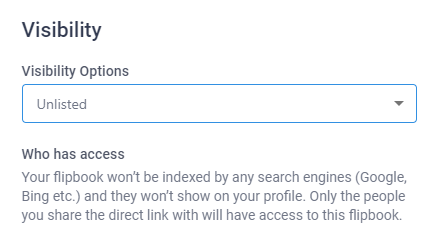 They won't appear on your public profile and they won't be indexed by the search engines. If you want to find out more about this option, don't hesitate to click here. 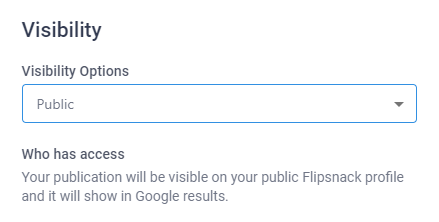 Important: Please take into account that once you've set your flipbook as public, you can't change it to unlisted, but we can offer a solution for this type of situation. You can see more about it here. 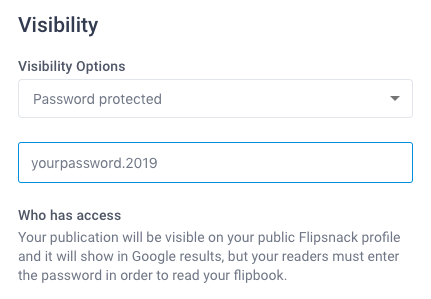 If you need a secure way to publish your flipbooks and keep the content safe, we would recommend the Password Protected option. This way only the readers who will receive the password will be able to access the creations you've decided to share with them. This feature is available with our Business Plan and Enterprise Plan. If you believe this would be a good option for you and want to find out more about this possibility, feel free to click here. Another great way of sharing your flipbooks, available for our Business and Enterprise Plan users, is sharing the flipbook with specific people only. This is the most advanced and secure way you can share your catalogs. You'll be able to add the email of the person you wish to share the publication with and they will receive a link to it on their email. Your readers will have to sign in or sign up, depending on the case, in order to read your publication. If someone who doesn't have access to it wants to read it, they can send you a request via email which you can grant or not. If you wish to find out how only those invited can read your publications, please click here. We hope you will find these options as useful as we do, and if you have any questions about them you can also reach us on the live chat.